SPAR FAI Primary School 5s Programme 2019 Kicks Off! 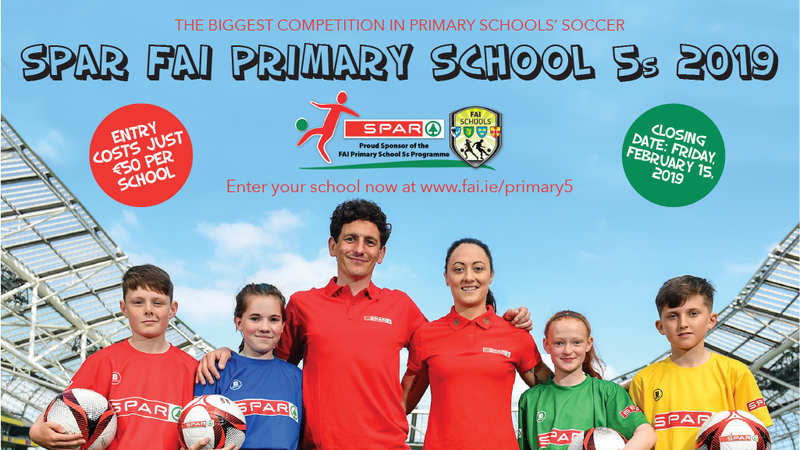 The highly anticipated SPAR FAI Primary School 5s Programme has kicked off for 2019. The SPAR5s as it’s commonly known, is a 5-a-side competition which is open to boys and girls from 4th, 5th and 6th class, and puts emphasis on fun and inclusivity. The blitz day format is coordinated at local level with the assistance of a network of FAI Development Officers and local primary school teachers. These personnel co-ordinate events at County level with qualifying schools progressing to Regional, Provincial and National Finals. The programme has approximately 37,000 students participating this season with a remarkable 42% of those participants female. There are 6 divisions to suit all school sizes with small, medium and large schools all catered for. While the programme encourages boys and girls to play on the same team, there is also a separate competition for girls’ schools. A number of teams can represent one school depending on the size of their student body, giving more children the chance to develop their skills in a safe, child centered and exciting environment. SPAR have been the Official Convenience Retail Partner for the FAI since 2012. While there are many elements to their partnership agreement, the emphasis for the retailer is to support and promote grassroots football in the local community.